The University Book Store on 711 State Street is home to The Campus Shipping Center, where we offer packing and shipping as an Authorized Ship Center for FedEx® and UPS®, as well as providing standard USPS® services. You can buy boxes and supplies, bring in ready to ship packages, or we can professionally pack and ship your items for you- whether it's a letter, bag of clothes, big-screen TV or almost anything else. 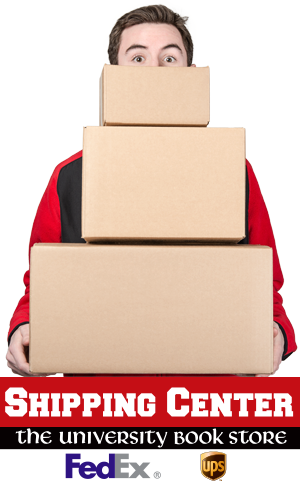 With some of the lowest shipping rates available and a huge selection of supplies at great low prices, we've got all of your shipping and moving needs covered! We have bubble envelopes as low as $0.55, packing tape starting at $1.79 a roll, bubble wrap starting at $1.95 a roll, mailing tubes as low as $1.29, and more than 75 different boxes of all shapes and sizes with prices as low as $0.59. Not sure what you need or how to pack something? Ask our friendly packaging experts for advice on what materials and methods will best suit your needs. And while we cannot pick up your item, we do offer the use of two-wheel or four-wheel carts to our customers at no-charge for those items that are too large or heavy to carry. Not sure how to pack a large or odd-shaped item? Some items simply require specialized packaging, and our custom packaging service is the way to go. We can custom cut or create packaging to fit your items- saving you time, money, and a whole lot of hassle. There's almost nothing we can't pack and ship! Don't want to lug your extra personal or business items to the airport? Stop by our store and we will take care of your luggage shipping needs. We have cost competitive options to get your luggage where it needs to go so you can avoid airport hassles and high baggage fees.